Gas Insert vs Gas Logs | Which Setup Is Best For Your Home? Gas insert vs gas logs, which one is best for you? If you’ve made the decision to go with a gas fireplace, the next decision is an insert or gas logs. Knowing the difference between these options will help you make the right choice for your needs. Both designs will provide you with the ambiance you want and help you heat the area. However there are some key differences that you should be aware of. The most notable difference is seen in the fuel efficiency levels. 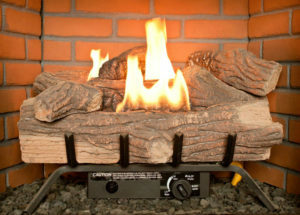 Vented gas logs are about 10% efficient and carry a higher cost to operate. As the BTU level of vented gas logs increases, the operation costs also rise. A steady pilot light is convenient, but it also adds roughly $10 a month to the overall expenses. By contrast, gas inserts are far more efficient with levels of 80% or higher. The operation costs are lower, so they’re more effective at heating a room. The gas logs are more appropriate for adding some ambiance. Gas inserts also feature electronic pilot lights so that you can further reduce your expenses. Both versions feature a glass front. The glass doors on a log set are movable and must be fully opened when the system is in use. The glass front of an insert is a fixed glass face that will not move. While the flames will be visible, the insert will not be accessible by consumers. If you love the look of doors but want the insert, then choose a model that features faux doors. This will closely simulate the appearance of a traditional fireplace. Another important consideration is the size of the chimney. One thing to keep in mind when weighing a gas insert vs gas logs is while inserts burn very clean and only need a small, flexible, heat-resistant pipe for the chimney, the gas logs will need a larger chimney to vent away the soot and smoke that is produced. If you’re converting a wood-burning fireplace to a gas appliance, then you can go with either option. In the event that you’re adding an appliance to a space, then the gas insert may carry lower installation costs as a result of the smaller chimney. Gas logs are generally a great choice for people who want the ambiance by aren’t worried about effectively heating a space. They’re ideal for rooms that are infrequently used, and they’re available in a wide range of styles. However, inserts are effective heaters that can help you get control over your utility bills. They’re a top choice for family rooms and even bedrooms that tend to be cold. Many people want to know what the price difference is between a gas insert vs gas logs. If you’ve made the decision to go with a gas fireplace, then the next decision you’ll have to make. In general, more energy efficient appliances carry a higher price tag, and gas inserts are no exception. While you can get a decent set of gas logs for about $500 or less, most inserts start at about $2,000. A high-end gas log set can be found for about $1,000, but you can expect to pay closer to $5,000 for quality gas inserts. With either design, you’re encouraged to let a professional handle the installation to ensure that everything is property vented and ready for use. If you don’t have natural gas in your area, then you can go with propane instead. Most retailers sell propane heaters, or the systems can be easily converted to suit your needs. This means that you can have a beautiful and efficient fireplace even if you’re outside of a natural gas service area. Make your property more attractive by adding a fireplace, but choose the right one for your needs. If you’ve ruled out wood burners due to the mess and hassle, then gas-burning appliances are a smart choice. Gas logs are attractive and look like the real thing, but they will only warm a very limited space. They operate inefficiently, and they require a larger chimney. However, they’re more affordable initially than gas inserts. If you’re interested in effectively warming any area of your home, then the gas inserts are the right choice. Inserts are safe, attractive, and far more energy efficient than the gas logs.